Tottenham Hotspur won a 4-0 victory over Huddersfield Town at Tottenham Stadium on Saturday (4/13). In the crush of the Champions League schedule against Manchester City, Tottenham Hotspur manager Mauricio Pochettino chose to rotate players while serving Huddersfield in the Premier League 2018/2019. Facing Huddersfield who have ascertained relegation, Tottenham appeared dominant. This north London team has the ball up to 70%. The hosts recorded 22 shots with five leading to the goal and two on the goalpost. While Huddersfield only has seven experiments where one is on target. Tottenham spread the threat when the game runs 10 minutes. Victor Wanyama got the ball from Fernando Llorente and fired a thin shot to the right of the goal. It took up to 24 minutes for Tottenham to score the first goal against Huddersfield. Ben Davies’s bait could not be well received by Fernando Llorente. Victor Wanyama took possession of the ball into the penalty box. Had passed the goalkeeper Ben Hamer, Wanyama then opened fire on the goal that was not guarded and changed the score on the scoreboard to 1-0. Three minutes later Lucas Moura became Spurs’ second goal scorer. Hard right kick from Moura breaking into Hamer’s goal. The goal began through an attack from the right wing. Moussa Sissoko who got the space to be the creator of assists to Moura. Spurs’ two-goal advantage lasted quite a long time. Moura, Llorente, Ben Davies and Christian Eriksen failed several times to complete the opportunities they got. In addition Huddersfield was also noted to have the opportunity to break into goalkeeper Hugo Lloris. Huddersfield had a chance in the 30th minute. Juninho Bacuna’s pass from a corner was struck by Jon Gorenc Stankovic in front of the goal, but his shot went wide. Tottenham almost changed the score to 3-0 in the 39th minute. Christian Eriksen’s gastric pass from a free kick was greeted by Llorente’s header which ended thinly to the side of the goal Sissoko’s hard kick not long ago far from the target. No more goals in the remainder of the first half. Llorente Almost made Tottenham added a goal in the 47th minute. Juan Foyth gave a pass to Llorente in the penalty box and finished with a shot that just hit the crossbar. Tottenham continued to press. Moura pushed in the 64th minute and directed the ball flat towards the goal. Hamer can tame the ball. A minute later Llorente got another chance, this time welcoming Davies’s cross. His header went wide. Huddersfield built the attack in the 70th minute and almost jeopardized the Tottenham goal. Bacuna tried to release a kick under the pressure of the host defender. The ball hit Davinson Sanchez then secured Hugo Lloris. A kick from Eriksen in the 74th minute just wide. The visitors spread the threat of a dead ball in the 80th minute. Bacuna’s free kick leads to the top left corner of the goal, but Lloris can still be driven away. Tottenham responded. From the counter-attack, Eriksen received a pass from Walker-Peters and cheated the ball past the keeper. But the goalpost failed to score. The third goal was obtained by Tottenham in the 87th minute. Eriksen’s accurate feed from the right was completed by Moura in the middle and conquered Hamer. 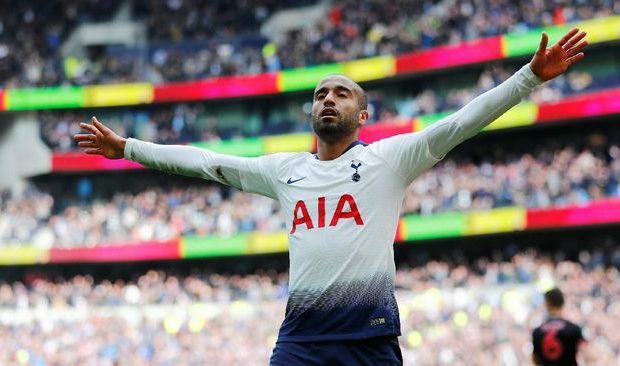 Moura recorded a hat-trick in the 93rd minute, while finishing Tottenham’s victory 4-0. A quick attack was built through Son Heung-min, who then handed a pass to Moura on the right. The hard kick from the Brazilian player could not be dammed by Hamer. The match finished with a score of 4-0. Three points from home games make Tottenham third in the standings with 67 points or one point ahead of Chelsea who played on Sunday (14/4) against Liverpool.